New from Tempting Tangles. This is "The Blue Poppy Learning/Sampler SAL". 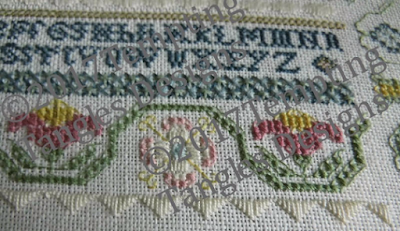 In this SAL, you will have excellent instructions on how to create a myriad of pretty stitches! If you are NOT on Facebook, we will gladly email you the parts as they are released. Please be sure to give us your Facebook name and hopefully, the link, so when you purchase so we can find you and add you in. Read the details on the Etsy Shop listing. Or, send $12 USD to temptingtangles at gmail.com on www.Paypal.com. 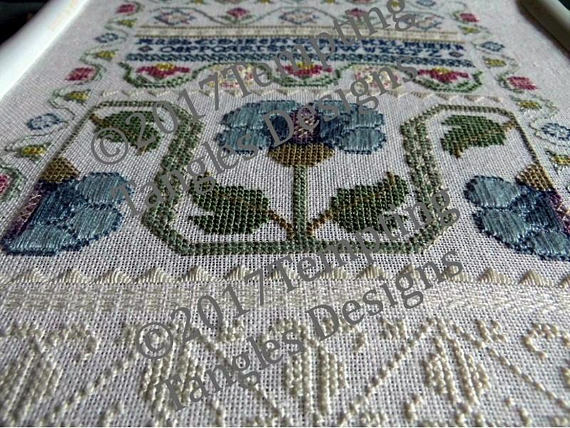 Recently re-worked model for our specialty stitch Blue Poppy Learning Sampler SAL. Here is the original which has hung on my living room wall since 1982.